While social media may have started as a place best reserved for pictures of your lunch or your pets, it’s since become a highly useful way for professionals and businesses to communicate. Social media platforms like Twitter, LinkedIn, and Facebook can also have a major influence on how clients and potential employees view a particular brand. Individual employees are also able to have a significant impact on how their employer is perceived, and this influence extends beyond social media. Staff members can act as powerful brand ambassadors for their employer when it comes time to recruit potential new hires or customers. Social media has become our source for everything, from political news to cat videos to information on employers. A 2015 LinkedIn survey found that 50 percent of job seekers turn to their friends and colleagues first when looking for a job. So what your employees are a saying about the organization will hold a lot of weight with potential candidates. If these thoughts are positive, it can encourage people who see the post to consider applying for open positions within this company, thus directly impacting recruiting efforts. If they’re constantly firing off passive aggressive statements about how they’re longing for the weekend or dreading Monday, it’s an indication that maybe things aren’t ideal at their place of business. Think about this real world example: you’re a mid-level professional who is moderately happy in your current role, yet you aren’t totally sold on your company. You know there’s not much more room for advancement where you are currently. If you want to grow in your career, eventually you’ll have to seek employment somewhere else. You also happen to be part of the 65 percent of adults who are on social media. Sometimes when you log on, you notice a friend from college posting positive statuses about his job. He talks about the promotion he just got, the conferences he gets to attend, and the company picnic he’s looking forward to in a few weeks. You remember that you and your friend shared a similar major in college, and these statuses get you thinking: if your friend is so happy at this company (which appears to be similar to your current employer), maybe it’s worth investigating whether this business has open positions that you might be qualified for. You check out the company’s website, or maybe you send your friend a Facebook message to get more information. You might eventually submit your materials for consideration when a job at this organization becomes available. This friend, whether he realizes it or not, is serving as a brand ambassador for his company. His positive Facebook posts are helping with the business’s recruiting efforts in a way that’s often more powerful than any job posting in a trade magazine. He’s giving direct testimonials about why someone would want to be part of that company’s team. It’s essential that managers recognize the power of this type of employee (the kind who serves as a brand ambassador) and that they place value on the social currency he’s generating. #socialmedia let’s #jobseekers get to know your employer brand. What are your employees saying? The employee-turned-brand ambassador is hard to come by, though. If someone’s social media posts feel forced, their ability to influence people within their network plummets. So how can hiring managers encourage veteran members of their team to fill this essential role? If your employees head to their desks one Monday morning and see a memo telling them that they must post about at least three positive things happening at work per day, expect some backlash. Many people view social media as a type of creative outlet, and telling them what they have to write feels like an invasion of privacy. The most impactful type of brand ambassador work happens totally organically, not because people feel that they must create this kind of content to preserve their jobs. Truly influential brand ambassadors aren’t fed copy points and forced to spout them off nonstop throughout the day. They speak because they actually believe in the product. One way to get employees to voice authentic, positive words about their place of business is by making sure that they actually enjoy coming to work each day. When team members feel valued and appreciated, they’re more likely to spread the word about how much they enjoy their jobs. While focusing on your company’s bottom line is necessary in order to stay afloat, take a look at the big picture experience too. Can you provide opportunities for your employees to continue to develop? Do this by sending them to conferences, or by bringing in speakers to touch on relevant topics in your field. 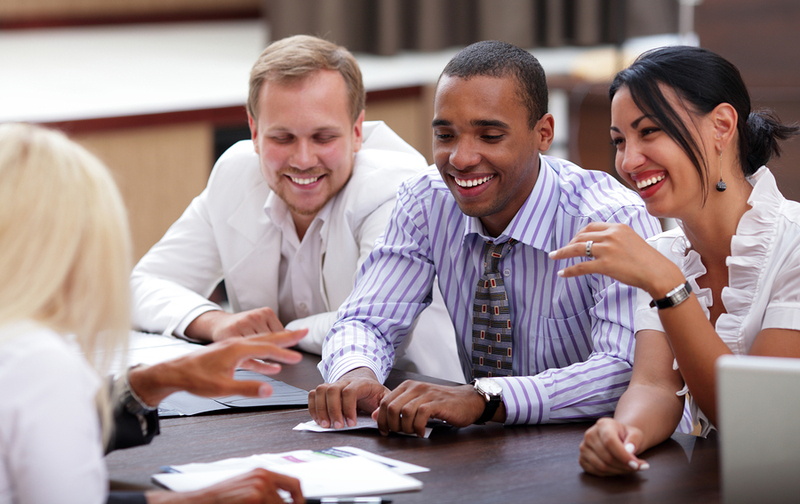 Do you promote camaraderie at work? Events like office happy hours or company softball games let your staff members get to know one another. This makes heading into the office each day a more enjoyable experience for everyone. These details may seem small, but they all contribute to making your office a place where people are excited to spend their days. This breeds the most effective brand ambassadors. It’s amazing how something as simple as passing out sweatshirts or coffee mugs with the business’s logo on them boosts employee pride. When everyone in the office feels as if they’re part of one team, company unity increases. In a small way, it’s almost like you’re athletes wearing the same uniform. You wouldn’t see the shortstop for a baseball team wearing a blue jersey, while the pitcher is wearing red and the catcher is donning green. In order to signify that everyone is working towards the same goals, they wear the same colors. Small tokens of company unity can help bring about this cooperative mentality within your office. Your employees aren’t required to act as brand ambassadors, so it’s important to reward those who willingly take on this role. You might consider putting a program into place that rewards team members who speak proudly about the business. Offer bonuses for those who help recruit new employees or truly show company spirit. Some businesses also find value in developing an “Employee of the Month” program to highlight those who truly embody the company’s core vision. There are managers who put strict social media policies in place, restricting employees’ use of these platforms during the day. While social media can certainly be a distraction, those who value using their staff members as brand ambassadors might find that relaxing these policies benefits the business as a whole. Sure, you don’t want team members tweeting instead of getting essential tasks done, but allowing employees to take a minute to post a picture of something that illustrates strong company culture (everyone celebrating after hitting a sales goal, for example) reinforces what your business can offer clients and prospective employees alike. If you want your staff to go to bat for you, transparency becomes essential. You can’t expect an individual to advocate for the company on LinkedIn after walking into the office the previous day and learning that 25 percent of the staff has been laid off. In order to earn employee loyalty and support, be honest about issues. Make it a point to acknowledge problems within the business, and highlight your plans to fix them. It’s also helpful to provide context by explaining what’s going on within the industry as a whole. Your staff members understand your business better than almost anyone else; in fact, sometimes they have a clearer understanding of the company than upper management. Because of this, it’s important to take team member suggestions seriously. If you’re constantly hearing complaints about certain policies, consider making changes. When employees feel as if their thoughts are valued, they get more invested in the business. When employees come to work each day and don’t have a sense of that business’s long-term goals and vision, it makes it challenging for them to feel invested in their work. What’s the point of all of this effort? What are they working towards? When you create a company culture that is powered by well-publicized values, you’re keeping your staff on the same page. In turn, this can make employees more passionate about the business. They know what they’re working for and why it matters, and they truly feel as if they’re part of a team. Some staff members might be thrilled to act as brand ambassadors, both on and offline, however they might be unfamiliar with social media and its best practices. This limits their ability to share why they love their job with others. Instead of discounting the value that these individuals can bring, take time to provide them with coaching to get them up to speed. How do sites like Twitter and Facebook work? What kinds of content reflects positively on the business, while still appealing to those who might read it? What are some best practices to keep in mind when using social media? This will get employees comfortable using social media, despite how frequently — or infrequently — they might have used these platforms in the past. It’s no secret that a company website is a powerful recruiting tool. Potential new hires scope out business sites to get more information about the company, and to get a sense of what working for that brand is all about. One way to set your site apart from the rest of the pack is by creating an employee-driven blog where interested applicants can read directly from team members about what it’s like to work for your business. Let them highlight a project they’re working on, a new client they landed, or something light-hearted, like their recent victory in the company badminton tournament. You can tap one person to run the blog, or consider alternating each month. This gives employees a chance to express themselves, while offering different perspectives on office life. Because there is some extra work involved, you might consider offering a gift card or other small incentive to those who take on the bulk of the writing work. Want employees to help your #employerbranding? Focus on creating a great workplace first. From a staff member’s perspective, it can be difficult to understand why acting as a brand ambassador is so important. Besides the obvious benefits for the company, acting as a brand ambassador can help fast track an individual employee’s career. Serving as a brand ambassador is a subtle way to show company leadership that you’re invested in the business, and are engaged with the company’s long-term mission. This can help you set you apart as a leader, which is valuable when promotions or other opportunities within that organization become available. If management knows that you care deeply about your job and the company, they’re more likely to consider you for these opportunities, as opposed to someone who punches the clock and leaves just so that they can collect a paycheck. When you convert your employees into brand ambassadors, you’re turning your staff members into powerful advocates for your business. Brand ambassadors are an essential part of the hiring and recruiting processes. Additionally, when employees are proud to represent their brand, they’re more engaged and productive at work each day. In order to encourage your staff to want to take on this role, start with an analytical look at what it’s like to work for your business. When you continuously present opportunities for additional learning and bonding with co-workers, you make the office an exciting place to do business. In turn, it becomes someplace that employees are proud to represent, both on and offline. How do you encourage brand ambassadors at your business? Share in the comments below!